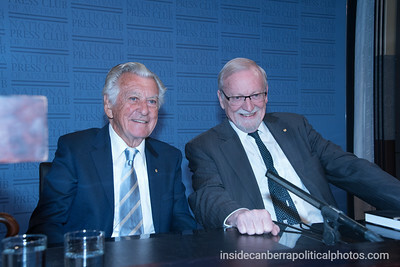 Gareth Evans' book “Incorrigible Optimist: A Political Memoir”, launched at the National Press Club of Australia by Bob Hawke. 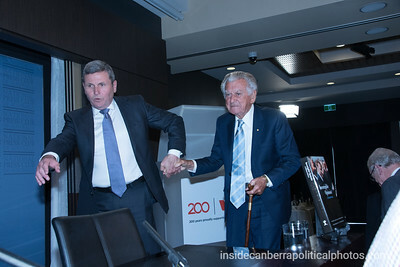 Chris Uhlmann, President of the National Press Club of Australia, helps Bob Hawke onto the stage. 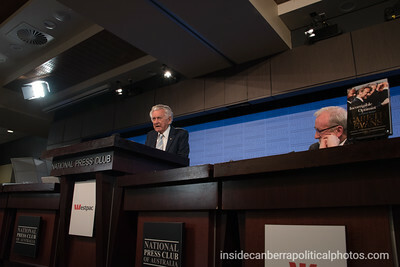 Former Prime Minister, Bob Hawke at the National Press Club of Australia with Gareth Evans. 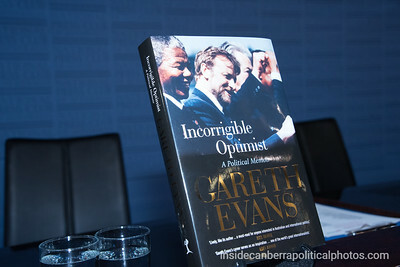 They were launching the book “Incorrigible Optimist: A Political Memoir” by Gareth Evans, a Minister in the Hawke government. 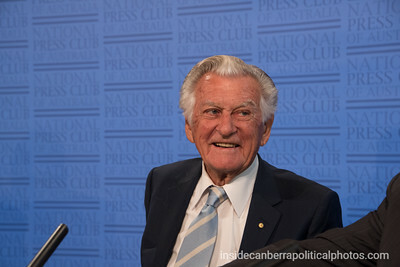 Former Prime Minister, Bob Hawke at the National Press Club of Australia with Gareth Evans. 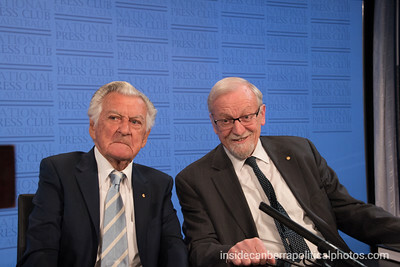 Bob Hawke and Gareth Evans discuss last minute arrangments with Chris Uhlmann before the National Press Club address went to air. 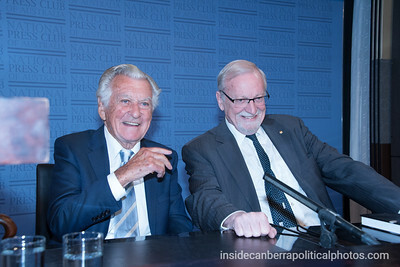 Bob Hawke smiles ahead of the book launch for Gareth Evans' book “Incorrigible Optimist: A Political Memoir”. 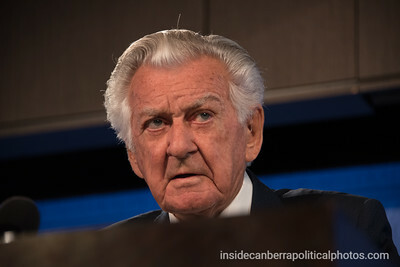 Bob Hawke, " During the 1950s, 60s and 70s, fierce factional infighting went on to get preselection for your favoured candidates for a safe and marginal seats." 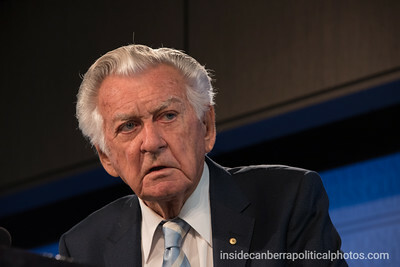 Bob Hawke, "From all these torturous processes, in some mysterious way that defies description, there had emerged by March 1983, when I won the Prime Ministership, an extraordinary range and depth of talent from which I was able to select a ministry and cabinet. 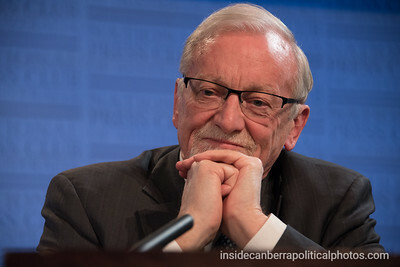 which is generally acknowledged as the best since federation." 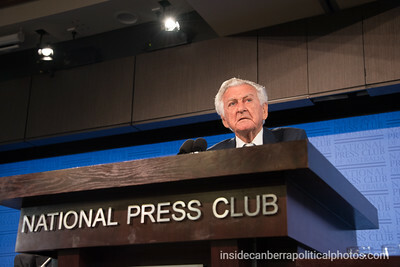 Bob Hawke during his opening remarks for Gareth Evans' book launch at the National Press Club of Australia. 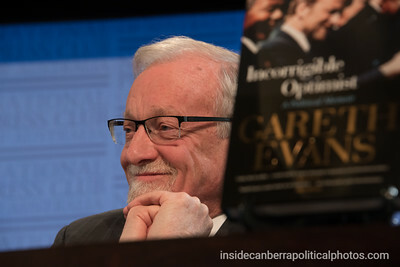 Gareth Evans listening to Bob Hawke speaking at the launch of Evans' book. 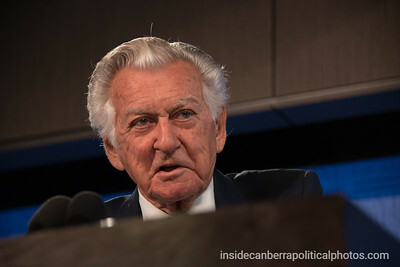 Bob Hawke, "In this book, Incorrigible Optimist, I think can best be seen as a detailed and stringently argued attempt to justify that adjective incorrigible, firmly fixed, not easily changed. 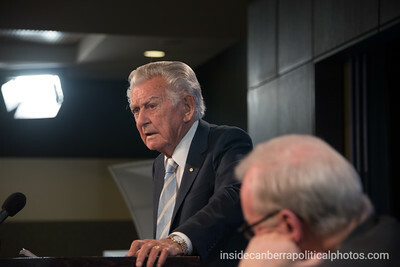 Bob Hawke, "It's for you to judge when you have read this gripping political memoire." 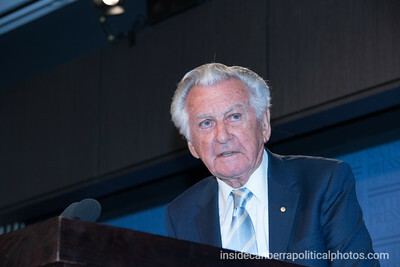 Bob Hawke, "While I have been an optimist most of my life, I am afraid that I cannot share Gareth's incorrigible optimism." 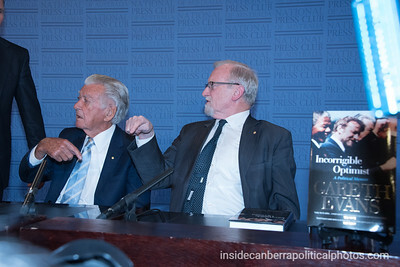 Gareth Evans listening to Bob Hawke speaking at the launch of Evans' book at the National Press Club of Australia. 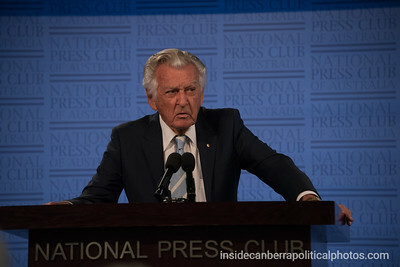 Bob Hawke, "Almost as venomous as Gareth's quip regarding Bronwyn Bishop when she also quotes why do you take an instant dislike to Bronwyn Bishop. 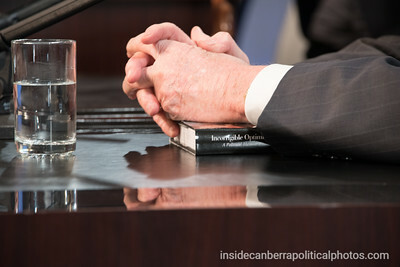 It saves time." 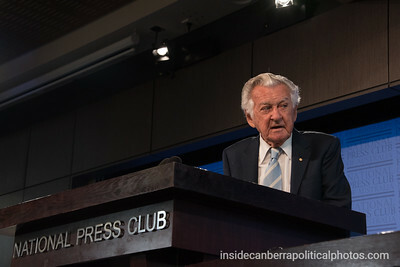 Bob Hawke talking about global warming at the National Press Club, during the his launch speech for Gareth Evans' book, Incorrigible Optimist: A Political Memoir." 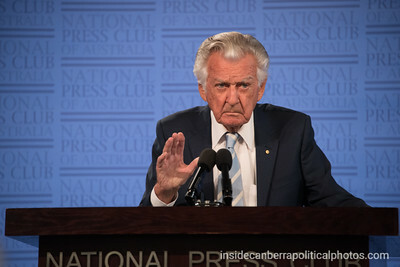 Bob Hawke, "There are two major differences between the situation today and that dangerous situation then. 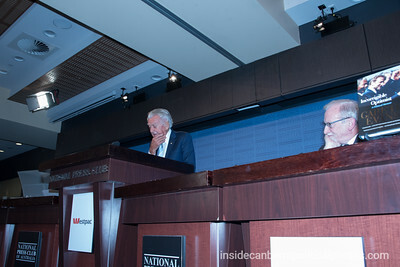 Firstly, in that situation of the Cold War, neither side wanted to, indeed it feared their own destruction. 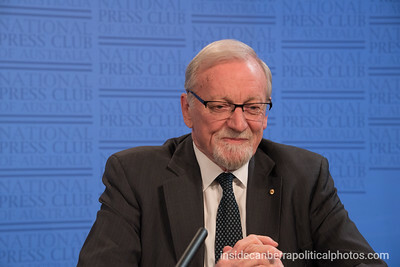 While today, the terrorists possibly welcome their own death. That is a massive difference." 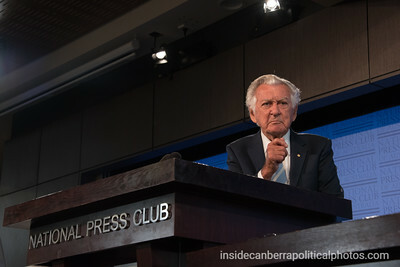 Bob Hawke, "As Foreign Minister, undoubtedly his pre-eminent contribution was as the authorative leader who brought peace to a ravished Cambodia." 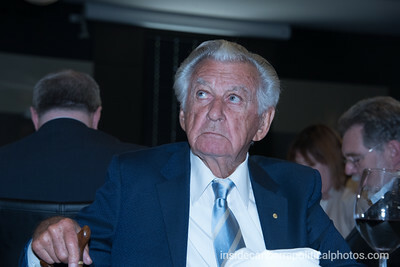 Bob Hawke, "But it has been since he left parliament that his work to give substance to that icorrigible optimism for a more secure world has been constant and presistent and it has been incomparable and his book rightly gives a great deal of detail about that work since he left parliament." 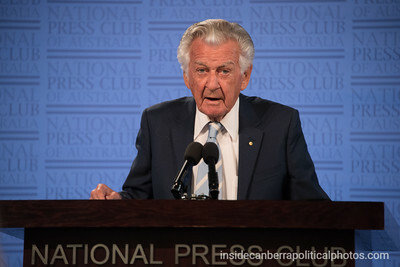 Bob Hawke, "First of all, Gareth's outstanding leadership of the International Crisis Group from 2000-2009." 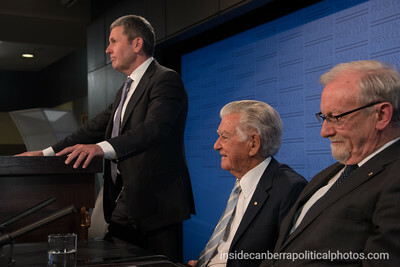 Talking about Evans' work after he left Parliament. 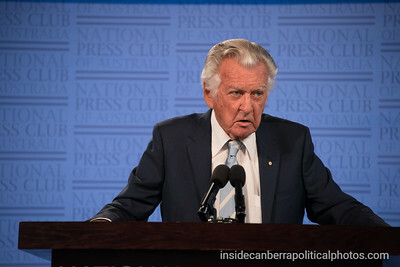 Bob Hawke speaking at the National Press Club of Australia during the launch of Gareth Evans' latest book. 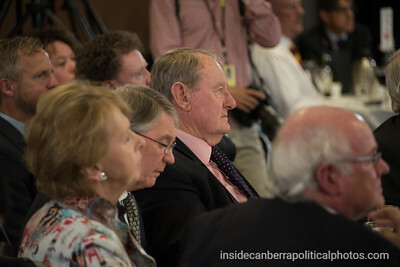 Ric Smith, former Defence Secretary and former Ambassador to China looks on as Bob Hawke address the National Press Club of Australia.